February: last bad month for EV sales in France? For more than 2 years, new EV registrations have been wrong in France. Everybody’s watching them because it’s the only data available, but they don’t tell the truth. Most new EVs registered last year have been bought by the government or public agencies, and 1,700 went to the Parisian Autolib car sharing service. That means that the actual EV market, with cars bought by individuals who drive them is still very small. February was another proof of that. There were exactly 647 new electric passenger cars registered last month in France. 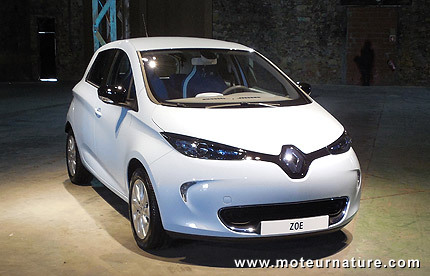 But more than 400 were Renault Zoe which were not sold. There were cars registered by the dealers for demonstration purposes, prior to the commercial launch of the Zoe on the French market, which is tomorrow. And that brings the great expectation that this period will now come to an end. The Renault Zoé is the first electric car with wide market appeal in Europe. There was the Nissan Leaf, but its range and performance are limited for a compact. The Zoé has more range than the Leaf, and it’s smaller (most notably in the back) so people will have less travel plans. Then, it’s much cheaper than the Leaf, even when the monthly rent for the battery is weighted in. When I test drove the Zoé, Renault told me they had many orders waiting, and those people will start getting their cars this month. There were also many people waiting for a test drive, which wasn’t possible earlier, and that should bring many new orders. So, it looks like a safe bet that there will a sharp rise in EV registrations in France, and it will come from real car sales, from individuals. Stay tuned for the actual data next month. My name is Tom and I live in Myrtle Beach, SC, USA. I recently purchased a Chevy Volt and downloaded the Recargo iPhone App. The app. had a link to your article on the Zoe. The Zoe seems like a nice EV except for the battery “renting.” I considered the Leaf, but it was not practical as an only vehicle due to the rang. The Tesla S has the range, but unfortunately I can not afford a Tesla! I love the Volt; so far I am averaging just over 200MPG, and am driving about 80% of my miles on battery power. I am currently building my house and will be installing a solar energy system. So in a few months I will charge my car for free, I’m very excited! My question to you is; is The Volt available in France, and if so for how much? My Volt was $40,000 US. I look forward to your answer and will continue to monitor your English website. Volt is €43,500 in France (19.6% VAT included) but there’s a €5,000 incentive, so customer only pays €38,500.